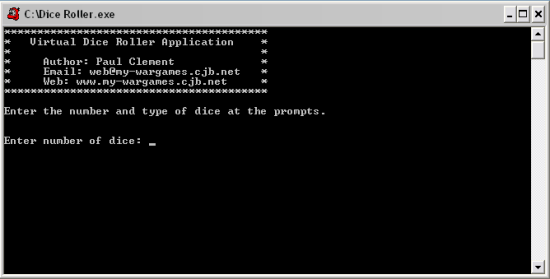 From this page, you can download a dice roller application for use on your computer. It is written in C++ and is my first attempt at programming, so I think it turned out quite well. This program is released under the GNU General Public License, and there is therefore two versions available. Unless you want to build the program from the source code, or modify the program, I recommend that you download the binary version. PLEASE NOTE: This program has only been tested on Windows. If you use this program on a different operating system, please tell me if it works by sending an email to: paul@my-wargames.net.